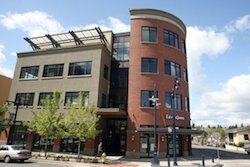 A Navy Federal Credit Union branch opened in downtown Bremerton Monday, after relocating from Auto Center Way. The new branch is located at 555 Pacific Ave., Ste. 110, in the Sixth and Pacific building. Navy Federal spokesman Brian Parker said downtown offices provide easier access for members. “With the proximity to the shipyard, and the ferry terminal really, its really a key location for our members,” Parker said. The full-service branch includes an ATM, mortgage services, and a coin sorting machine. Parker said staff includes 10 full-time and five part-time employees. Navy Federal has about 23,000 members in the Kitsap area. Hours are 9 a.m. to 5:30 p.m. Monday through Friday, and 9 a.m. to 1 p.m. Saturday. Navy Federal is the world’s largest credit union, with 259 branches nationwide, including seven in Washington State and two in Kitsap County. The credit union plans to open 20 new branches this year. A Tacoma branch is slated to open this spring, according to a news release. Navy Federal is open to all Department of Defense and Coast Guard active duty, civilian, and contractor personnel and their families. The opening of the credit union branch is a positive development for the Sixth and Pacific building, which narrowly avoided a foreclosure sale this winter. Group Health, Edward Jones and Distributed Energy Management also have offices there.